Konica Minolta unveiled its Workplace Hub to much fanfare at its “Future of Work” event in Berlin on 23 March. 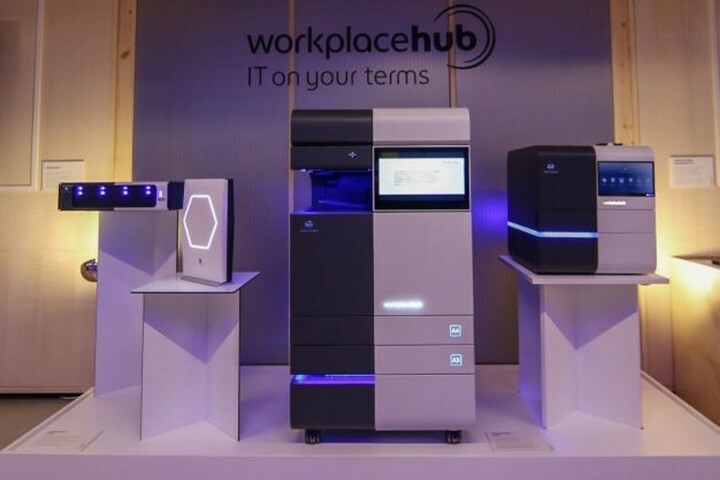 An intelligent IT platform, Konica Minolta believes Workplace Hub will revolutionise IT management describing it as “the world’s most connected intelligent edge platform for the workplace of the future”. Konica Minolta opened its event with a perspective on the future workplace, which it sees as being characterised by connected, disparate devices which form the part of the? Internet of Things (IoT) landscape. Konica Minolta defined the future workplace as one where individuals need access to the information they need to be creative and flexible. As the market evolves, IoT, artificial intelligence and machine learning will support smart decision making and collaboration in businesses. The Workplace Hub represents the next phase in Konica’s Minolta’s strategy to position itself as a IT services provider that addresses the needs of this evolving workplace. Konica Minolta describes Workplace Hub as a next generation IT management ecosystem, integrating hardware, software and services into a multivendor, single platform. Workplace Hub includes a multifunction printer, data storage, HPE server, Wi-Fi access points and hybrid cloud. It provides a standardised model for managing IT resources. The Workplace Hub is targeted primarily at small and medium business (SMB), who do not have the time or resources to manage IT in-house. The Workplace Hub provides a single point of contact to resolve all IT issues, enabling IT managers to focus on more strategic activities. The admin dashboard includes Wi-Fi management, asset management, storage and backup settings, security control, user management and access to Konica Minolta Marketplace. This is a business application store which includes third party business productivity applications, infrastructure services and professional IT services such as workflow or document management solutions. Konica Minolta offers single invoice billing for the complete Workplace Hub ecosystem. Also included is Workplace Hub Team Space, accessed via a web browser, which offers enhanced communication tools such as audio and video meetings and chat screen sharing. Konica Minolta also offers Workplace Hub Managed IT services where it provides installation and remote monitoring services. Konica Minolta’s strategic partners include HPE, Sophos and Microsoft and access to online software and IT services is via the Konica Minolta Marketplace. Version one of the Workplace Hub will be available in Autumn 2017. The platform’s future product roadmap includes integration of Internet of things (IoT), artificial intelligence, “intelligent edge,” and decision-support capabilities. With the announcement of Workplace Hub, Konica Minolta stands apart from its traditional competitors in the print industry by demonstrating a strong and clear vision for innovation beyond its traditional heritage. While it is entering new markets that are outside its normal domain, it is offering up new possibilities for the ubiquitous MFP to remain relevant in the future workplace. By integrating IT infrastructure and service capabilities in one device, it will be an ideal solution for SMBs that want a simple and flexible approach to managing their print and IT infrastructure, while providing an open platform for new technologies in the future. Konica Minolta has set a stake in the ground for the print industry that must push the boundaries for the workplace which will become more driven by analytics, automation and broader device interconnectivity. However, in order for this to be more than a glorified MFP with an integral server and cloud service wrap, Konica Minolta will need to do more to build the ecosystem. It will need to work closely with the major partners already on board and stimulate a true third party marketplace of applications. This will help ensure that the Workplace Hub can add real business value. Ultimately, it will not be a simple transition – Konica Minolta will need to work hard to change perceptions of its brand as a key player in the IT space. Engagement with channel partners will be crucial to ensure they are on board with this major change in direction for the company.